The Gloucester Fisherman AmeriScape ornament is a hand-painted relief sculpture by Hestia Creations and is gift boxed with a ribbon for hanging. 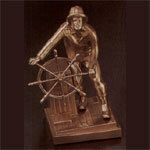 The ornament depicts the Gloucester Fisherman's Memorial, an eight-foot tall, bronze statue of a fisherman dressed in oilskins standing braced at the wheel on the sloping deck of his ship. The English sculptor Leonard F. Craske (1882-1950) designed the sculpture, and it was cast by the Gorham Company of Providence, Rhode Island, in 1925.